1 E None No Power Seat 1 E is a standard Business Class seat however, the proximity to the lavatory and galley may be bothersome. 1 L None No Power Seat 1 L is a standard Business Class seat however, the proximity to the lavatory and galley may be bothersome. 10 L None No Power Seat 10 L is a standard Business Class seat however, the proximity to the lavatory may be bothersome. 19 A None No Power Seat 19 A is a standard Premium Economy Class seat. 19 B None No Power Seat 19 B is a standard Premium Economy Class seat. 19 E None No Power Seat 19 E is a standard Premium Economy Class seat. 19 F None No Power Seat 19 F is a standard Premium Economy Class seat. 19 G None No Power Seat 19 G is a standard Premium Economy Class seat. 19 H None No Power Seat 19 H is a standard Premium Economy Class seat. 19 K None No Power Seat 19 K is a standard Premium Economy Class seat. 19 L None No Power Seat 19 L is a standard Premium Economy Class seat. 20 A None No Power Seat 20 A is a standard Premium Economy Class seat. 20 B None No Power Seat 20 B is a standard Premium Economy Class seat. 20 E None No Power Seat 20 E is a standard Premium Economy Class seat. 20 F None No Power Seat 20 F is a standard Premium Economy Class seat. 20 G None No Power Seat 20 G is a standard Premium Economy Class seat. 20 H None No Power Seat 20 H is a standard Premium Economy Class seat. 20 K None No Power Seat 20 K is a standard Premium Economy Class seat. 20 L None No Power Seat 20 L is a standard Premium Economy Class seat. 21 G None No Power Seat 21 G is a standard Premium Economy Class seat. 21 L None No Power Seat 21 L is a standard Premium Economy Class seat. 23 A None No Power Seat 23 A is a standard Economy seat that has extra legroom. The position of the bassinets may also be bothersome. 23 B None No Power Seat 23 B is a standard Economy seat that has extra legroom. The position of the bassinets may also be bothersome. 23 E None No Power Seat 23 E is a standard Economy seat that has extra legroom. The position of the bassinets may also be bothersome. 23 F None No Power Seat 23 F is a standard Economy seat that has extra legroom. The position of the bassinets may also be bothersome. 23 G None No Power Seat 23 G is a standard Economy seat that has extra legroom. The position of the bassinets may also be bothersome. 23 H None No Power Seat 23 H is a standard Economy seat that has extra legroom. The position of the bassinets may also be bothersome. 23 K None No Power Seat 23 K is a standard Economy seat that has extra legroom. The position of the bassinets may also be bothersome. 23 L None No Power Seat 23 L is a standard Economy seat that has extra legroom. The position of the bassinets may also be bothersome. 24 A None No Power Seat 24 A is a standard Economy Class seat that is missing a window. 24 C None No Power Seat 24 C is a standard Economy Class seat that has extra legroom due to the missing seat in front. 24 J None No Power Seat 24 J is a standard Economy Class seat that has extra legroom due to the missing seat in front. 31 E None No Power Seat 31 E is a standard Economy Class seat whose proximity to the lavatories may be bothersome. 31 F None No Power Seat 31 F is a standard Economy Class seat whose proximity to the lavatories may be bothersome. 31 G None No Power Seat 31 G is a standard Economy Class seat whose proximity to the lavatories may be bothersome. 31 L None No Power Seat 31 L is a standard Economy Class seat whose proximity to the lavatories may be bothersome. 35 A None No Power Seat 35 A is a standard Economy Class seat that has extra legroom however, the proximity to the lavatories and galley may be bothersome. There is no storage for this seat during takeoff and landing. The tray tables are in the armrest, making the armrest immovable and slightly reducing seat width. 35 B None No Power Seat 35 B is a standard Economy Class seat that has extra legroom however, the proximity to the lavatories and galley may be bothersome. There is no storage for this seat during takeoff and landing. The tray tables are in the armrest, making the armrest immovable and slightly reducing seat width. 35 C None No Power Seat 35 C is a standard Economy Class seat that has extra legroom however, the proximity to the lavatories and galley may be bothersome. There is no storage for this seat during takeoff and landing. The tray tables are in the armrest, making the armrest immovable and slightly reducing seat width. 35 J None No Power Seat 35 J is a standard Economy Class seat that has extra legroom however, the proximity to the lavatories and galley may be bothersome. There is no storage for this seat during takeoff and landing. The tray tables are in the armrest, making the armrest immovable and slightly reducing seat width. 35 K None No Power Seat 35 K is a standard Economy Class seat that has extra legroom however, the proximity to the lavatories and galley may be bothersome. There is no storage for this seat during takeoff and landing. The tray tables are in the armrest, making the armrest immovable and slightly reducing seat width. 35 L None No Power Seat 35 L is a standard Economy Class seat that has extra legroom however, the proximity to the lavatories and galley may be bothersome. There is no storage for this seat during takeoff and landing. The tray tables are in the armrest, making the armrest immovable and slightly reducing seat width. 36 E None No Power Seat 36 E is a standard Economy Class seat however, the proximity to the galley and position of the bassinets may be bothersome. 36 F None No Power Seat 36 F is a standard Economy Class seat however, the proximity to the galley and position of the bassinets may be bothersome. 36 G None No Power Seat 36 G is a standard Economy Class seat however, the proximity to the galley and position of the bassinets may be bothersome. 36 H None No Power Seat 36 H is a standard Economy Class seat however, the proximity to the galley and position of the bassinets may be bothersome. 44 C None No Power Seat 44 C is a standard Economy Class seat however, other flyers tend to bump into this seat. 44 J None No Power Seat 44 J is a standard Economy Class seat however, other flyers tend to bump into this seat. 48 A None No Power Seat 48 A is a standard Economy Class seat in the last row of the aircraft whose proximity to the galleys may be bothersome. 48 B None No Power Seat 48 B is a standard Economy Class seat in the last row of the aircraft whose proximity to the galleys may be bothersome. 48 E None No Power Seat 48 E is a standard Economy Class seat in the last row of the aircraft whose proximity to the galleys may be bothersome. 48 F None No Power Seat 48 F is a standard Economy Class seat in the last row of the aircraft whose proximity to the galleys may be bothersome. 48 G None No Power Seat 48 G is a standard Economy Class seat in the last row of the aircraft whose proximity to the galleys may be bothersome. 48 H None No Power Seat 48 H is a standard Economy Class seat in the last row of the aircraft whose proximity to the galleys may be bothersome. 48 K None No Power Seat 48 K is a standard Economy Class seat in the last row of the aircraft whose proximity to the galleys may be bothersome. 48 L None No Power Seat 48 L is a standard Economy Class seat in the last row of the aircraft whose proximity to the galleys may be bothersome. All Business Class seats have 110V power ports. Air France operates this version of the Boeing 777-200ER configured with 280 seats in three classes of service. It is flown on various long-haul intercontinental routes. Onboard classes include Business, Premium Economy, and Economy. Premium economy seats on this plane are AWFUL. You "recline" by sliding the seat down so that you are positioned in an uncomfortable slouch. Pure torture. No way to sit comfortably, let alone attempt to sleep. Food is standard economy fare. Prem Economy must use 1 of 4 lavs shared by 260 seats in economy and premium economy. Don't waste your money, you will be more comfortable in economy. Great seat for regular eco, great screen with usb , good movies , quite ok ! The new PE seats are only marginally better than the ones they replaced... this fixed-shell, 'slide to recline' formula doesn't bring comfort when trying to sleep although you don't have to worry about the passenger in front putting his seat back. Otherwise service on both legs of our YVR-CDG trip seemed reduced from past trips and the food service showed little sign of the extra paid for PE seating. Better to book one of the last 'duo' rows in Economy. Great legroom and side room on this Duo Seat that is well worth the extra fee. Probably the most room that Ive had in an economy seat for a longhaul flight. If youre traveling in a pair, pony up for this area of the plane! Good seat with plenty legroom. Only disadvantage is that you cant recline it! Service good and friendly. Meal ok. I agree with others it is not worth spending money on Premium Economy. I spent almost $400 to upgrade and it is not worth it. The seat is wider and there is a foot rest, along with more leg room. However, the seat doesn't actually recline at all, it just sort of shifts forward. Normal domestic airlines (united, etc.) have cheaper premium economy and it is better. Either upgrade to business or don't upgrade to Premium Economy. I paid a bit extra for. This Duo seat. Worked out nice that my friend and I had our row to ourselves. The aisle area next to the 46 k seat provided ample leg room. Their is about a 10 inch space between the L seat and the window. This was a mixed blessing-it provided extra space for "stuff" but made it hard to lean on the side to sleep. I brought along a small TETON self inlating pillow to sit on, this provided exra comfort. The video screen on the seatback was easy to see and access. It was easy to store a small carryon belo the seat in front of me. The rest room was close enough to be convieint but far enough away for it not to ne annoying. I just loved this seat! Greatest seat in the 777 economy cabin exit row. 35J has a low ceiling and the airplane's door reduces legroom dramatically. 35 J is close to toilets. Same for 35B on the right side of course. I booked a premium economy seat last minute for an extra $250 CDN because I thought it might by me some sleep during the night. I agree the design is odd in terms of slouching your posterior forward. I appreciated the foot rest. I appreciated the extra elbow room. I would not pay more for this seat necessarily as leaning against a window seat is almost as good. This new busines class is not good at all . New seat has a smaller seating part. The space is privacy but very narrow . Of course Air France offering 4 seats by row instead of 7......the space between 2 row is definitely smaller. Your legs are s"stored" in a tunel when you sleep. You feel the heart of legs from row behin you. If you travel 2 people together, it is not comfortable. 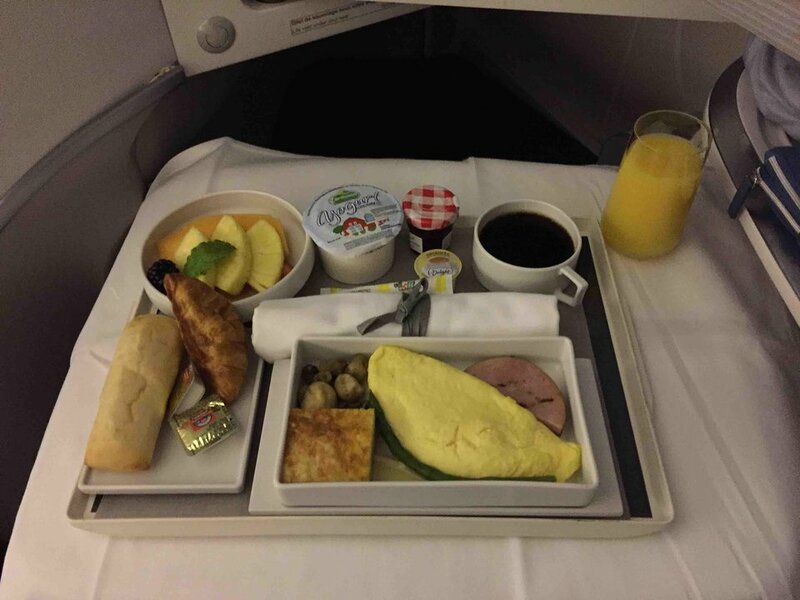 As for food and service you will have the good Air France standard. I regret the former business class. I definitely prefer the new Lufthansa one. 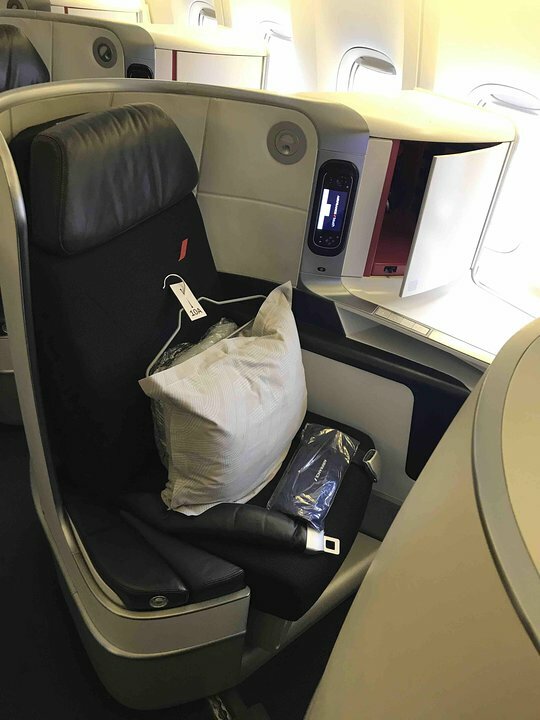 Flew from Paris to Atlanta in Premium Economy. Seats uncomfortable: when they rotate back there is inadequate leg room. Only way to get adequate lumbar support is to put pillow or blanket behind back. Considering this was Premium Economy : 1) Food for meal and snack very poor--worse than many economies especially given fact this is a 9 1/2 hour flight. 2)Except for meals,takeoff and landing, flight attendants never came by to check on passengers or offer anything and they were essentially nowhere to be found except in business section or rear of economy. Seats, food and service way better on Lufthansa Premium Economy. Flew CDG-BOM on Nov 1. Have to admit that I avoided AF for CDG used to be a horrible airport. Now, what a surprise! Besides having a very easy transfer at CDG, the aircraft -though 14 years old- had the new Business product and this is a really good one. Most spacious and private business class seat I've ever flown in. Good selection of movies, nothing super special though. Starters were nice and tasty, main course was disappointing. Crew friendly and polite. I do certainly consider revising my "avoid AF" strategy! Great lie flat seat, great service, best champagne I have ever had. A seat with very private feeling and lots of space (e.g. ottoman is quite wide). A far superior product compared to the angle lie-flat seats which are currently being refurbished. Flew back from New York the seat was great the service was even better. Having the evening meal in the airport lounge is a great touch giving you more time to sleep and certainly helped me overcome jet lag quicker. The selection of films is ok but I have seen better on other airlines. I travelled Boston to Paris economy.The seat is very narrow and uncomfortable,the trays are too small to be practical. When the person in front reclined it was even tighter. I would avoid travelling on this plane ever again. There are many alternatives. The 777-200 business class seats are much more comfortable and private than the Airbus version. The seats will go perfectly horizontal which makes a huge difference. However, be sure that you have nothing on the floor (not even sticking out from under the footrest) or the seat won't go down all the way. I didn't realize this until about 2 hours before landing. Also Seat 7E is next to a galley and the light is on and FA's talking all through the flight which can be bothersome if you're trying to get some sleep. Of all the seats in business class I'd say this one is the least private - although by comparison to many other long-haul business seats it's still great. Paid extra for these seats to avoid 3 in a row - what you don't know is that they configured the two seats so the window seat is so far from the window, you can't lean against it to sleep. Even with a pillow, it is too far away. There is good legroom however, as you can put your leg along the seat in front of you. As reported by others, no vent control. However, lots of space in overhead bins and steward(ess)s were very accommodating. Air France charged extra for this seat because it is at the front of economy class. It is horribly cramped, both in width and legroom. Totally unacceptable for a 10h+ flight. Despite AF's good service, this can of sardines is to be avoided at all costs. The premium economy seats on this plane are very uncomfortable for sleeping. They do not recline, and they put your back in a painful positon. The foot rest is useless, if not a hindrance. The other amenities are good, but a bad seat is a bad seat. Would think twice about paying for this again. Flew to NY on 24 May 15. Pleased to have the new seats, very comfortable, excellent food and service, good choice of films, far more spacious than Business on the AF 380. absolutely charming staff. 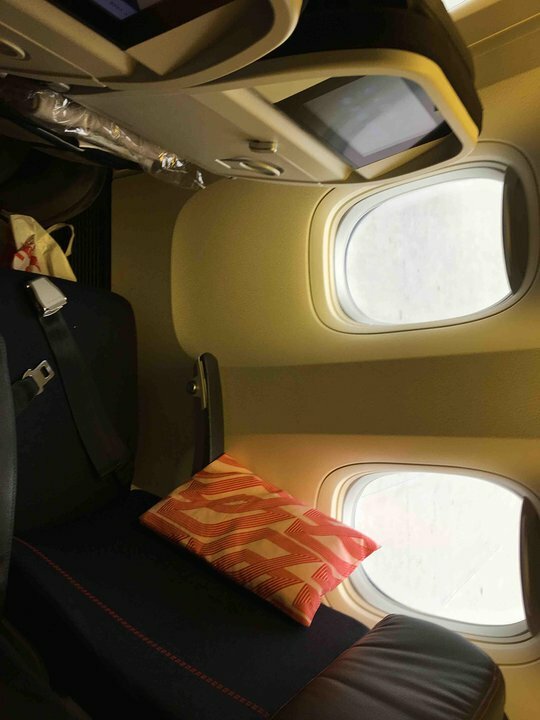 This seat is in Air France's new business class...wow! The seats in this section lay flat and have a removable partition for added privacy if the adjoining passengers are not traveling together. My husband is 6'2" and did not have space issues and was able to sleep comfortably. 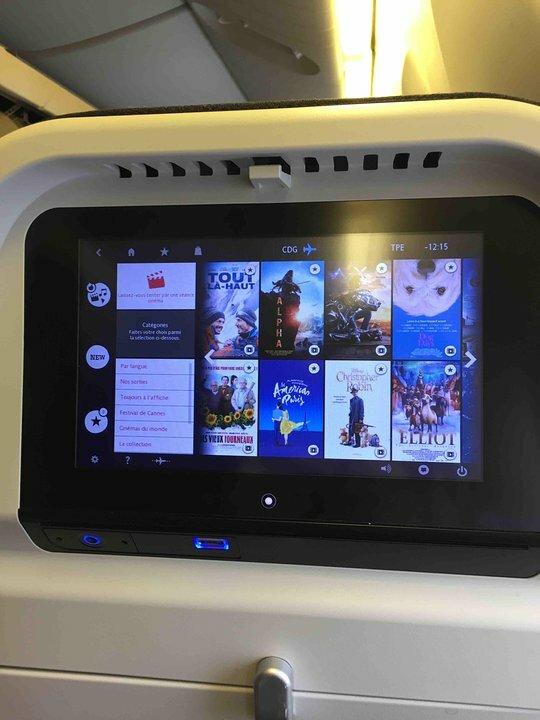 The entertainment system has also been upgraded, the screen is much larger than previous version and the noise blocking headphones are neatly stored in a spacious compartment located between the two seats. Service was akin to first class, it was exceptional. 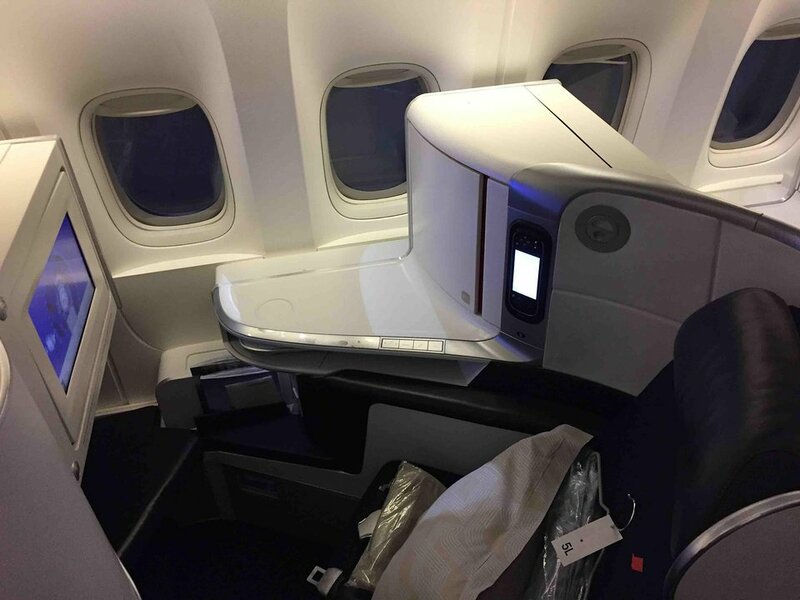 I hope Air France replicates this new business class model throughout their entire fleet. Surprisingly pleasant flight with enough legroom and comfort. Would definitely fly with Air France again. Reduced legroom. The cabin gets narrow here and so this seat is fitted skewed. On the Boeing 777-200's there is NO ventilation at the seats. This is so awful on a long haul flight, where you have no "above seat air vent controls" at all, so you have no fresh air, which you need, and which also has the benefit of blowing germs away, but mainly it is a benefit for temperature or climatisation control at the seat. Instead, you are subject to the AF flight attendants overheating the plane because they will inevitably respond to the squeakiest wheels, who are always the ones who complain loudest to say the cabin is too cold, so they turn the heat up to 90 degrees to keep these people quiet, meanwhile, the rest of the plane has no recourse without control of vents. It is absolute torture to sit through for 6 hours.